a sweet spot, an intuitive edge that helps us focus on some things very clearly. a blind spot, an aspect of reality that falls outside of our paradigm so we may not see this area as clearly. a hot spot, an area of vulnerability where we are particularly sensitive and touchy. 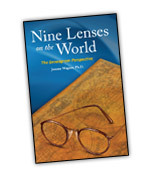 Nine Lenses on the World: the Enneagram Perspective can be purchased from Amazon.com in paperback and e-book formats. Intended for a general audience, this thorough yet brief guide through the Enneagram system provides a clear common sense outline of each of the nine styles. The resourceful characteristics and ideals of each style are contrasted with their non-resourceful idealizations. For example the Good Person’s passion for excellence can become a maladaptive pursuit of perfectionism. The adaptive energy, or virtue, of each style is contrasted with its maladaptive energy, or vice. What each style avoids and how they avoid it through specific defense mechanisms are detailed. How the distortion of each style may have developed and what each style misses because of its distortions are described. And the intrapsychic and interpersonal shifts that occur under relaxed and stressful circumstances are spelled out. The guide contains 30 exercises to help readers understand their own style by reflecting on their own experiences. Highly readable, it is a fine introduction and teaching aid for workshop presenters, business consultants, therapists, etc. The Enneagram Spectrum of Personality Styles can be purchased from Amazon.com in paperback format. The Wagner Enneagram Personality Style Scales (WEPSS) measures the resourceful and less-resourceful characteristics of each of the nine personality styles described by the Enneagram and gives an overall score used for determining one’s type. To take the WEPSS, you simply rate 200 words or phrases on a 5-point scale. The inventory generates a Total score, a Resourceful score, and a Less-Resourceful score for each style. The results are expressed as percentile scores based on a sample of 1429 people. The reliability and validity of the WEPSS meet professional testing standards. The WEPSS is the only Enneagram inventory reviewed in Buros’s Mental Measurements Yearbook, the recognized handbook in the testing field. “The WEPSS’s greatest appeal and widest use seems to lie in the context of Enneagram workshops, aimed at self-understanding and growth. With this in mind, it offers an attractive alternative to more traditional instruments that have as their primary function the identification of personality and emotional disorders. The author’s efforts to use quantitative psychometric tools to refine and evaluate an instrument inspired by a clearly humanistic or even mystic tradition are praiseworthy; too often, something as esoteric as Enneagram theory would be dismissed as outside the realm of such methods. how you can be more in balance. To take the WEPSS online for $10, go to www.WEPSS.com . To order hard copies of the WEPSS, that can be either self scored or scored from a CD on your computer, go to Western Psychological Services at 1-800-648-8857 or www.wpspublish.com. The WEPSS Manual which contains administering, scoring, and interpreting information as well as a 37 page Technical Section describing the psychometric properties of the WEPSS (standardization, reliability, and validity data) can be ordered through Western Psychological Services www.wpspublish.com.